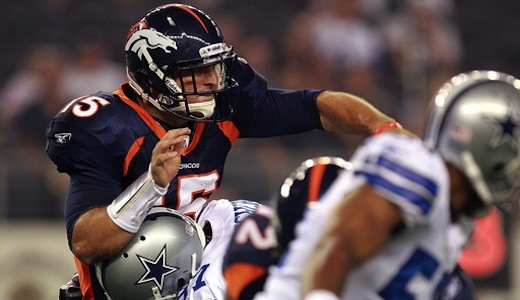 Ever since the Denver Broncos drafted Heisman trophy winner and two-time BCS champion quarterback Tim Tebow out of Florida in the first round of the 2010 NFL draft, the quarterback controversy in the Mile High City has been ongoing and seemingly never ending. 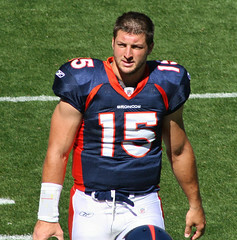 There is no question at this point in time that Tim Tebow is raw and rough around the edges in terms of developing as an NFL quarterback, but he is a huge fan favorite in Denver as all the passionate fans of the Broncos seem to want the second-year quarterback under center as soon as possible. Unfortunately, despite having a big upside and that kind of hybrid quarterback talent that seems to be the future of the position in the NFL, Tim Tebow is currently the third best quarterback in Denver behind starter Kyle Orton and backup Brady Quinn. With new head coach John Fox not particularly impressive the young quarterback that he inherited from Josh McDaniels, there is no real timetable for when Tebow might get under center again for the Denver Broncos. In Week 1 of the NFL regular season, the Denver Broncos played host to the arch rival Oakland Raiders in the Mile High City and were actually considered the favorites to come out on top. With an improved defense and an offense that looked at least a little bit better than last season, the Broncos were thought to get back on track, but did the complete opposite as they ultimately fell to the rival Raiders, 23-20. The Denver Broncos definitely had a legitimate shot of beating the Oakland Raiders in Week 1 as they did put a lot of pressure on Jason Campbell and company defensively, but their offense was not as good as anticipated with starting quarterback Kyle Orton struggling all night long. New head coach John Fox came in with the game plan to throw the football as much as possible, much like the majority of the league in Week 1, but despite 46 pass attempts for Orton, the veteran quarterback only completed 24 of those passes for 301 yards. Any game over 300+ yards is usually considered a good one, but not in Orton’s case as he threw for an interception, lost a fumble and failed to rally the team from behind in the fourth quarter with the game on the line. Personally, I don’t believe that Kyle Orton did a bad job in Week 1 as he was facing a much underrated Oakland Raiders defense, but the fans in Denver didn’t see it that way as late in the game they were chanting Tim Tebow’s name in an effort to persuade John Fox to make a change. The ironic thing is that even if Fox made a change at quarterback, Brady Quinn is the next in line as Tim Tebow sits at third on the depth chart at quarterback. Tebow would probably have a better chance of playing running back before he plays quarterback again for the Denver Broncos, but the controversy continues as the fans believe they know best about which direction this team should go in.